Why Is It Necessary to Rake Leaves off the Lawn? "Why is it necessary to rake leaves off the lawn?" is a question that many of us have asked. Some of them, such as those from red maple trees (Acer rubrum), look quite pretty lying on the grass, do they not? Moreover, they are, without a doubt, natural (and that is supposed to be a good thing, right?). But you may have neighbors who are out there raking leaves religiously in the fall. Other neighbors may not be raking them, but they are using blowers to clean up every last leaf. Viewing all of this activity may well have you wondering whether they know something that you don't or are simply guilty of being neat-freaks. 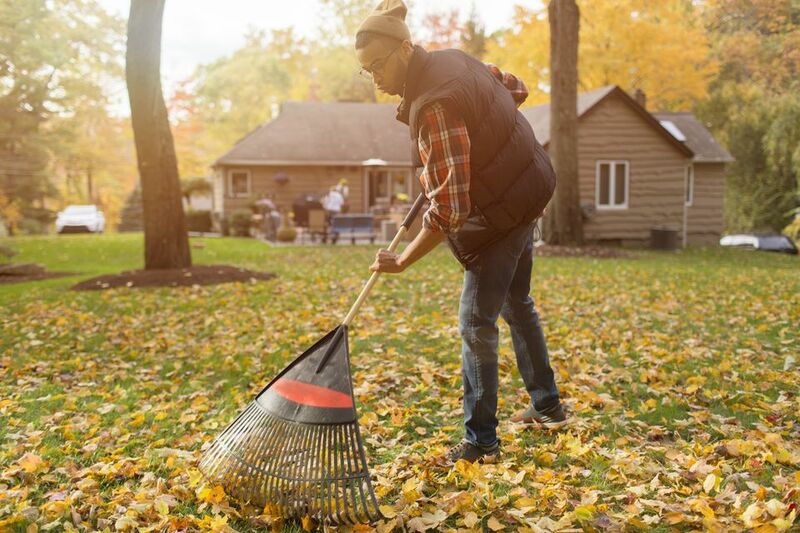 There is a sound reason behind raking leaves that has to do with lawn health; it is ​​not simply about giving your grass a tidy look. That lawns, too, have to "breathe." The lawn will be smothered in a thick layer of unshredded leaves if left on top of them over the winter. That such a layer can invite pests and diseases and can cause serious problems like snow mold and brown patch. That such a layer forms a barrier that blocks water, nutrients, and a healthy air flow from getting down to the root system of your grass. That, if the leaves are matted down, they can even keep new grass blades from emerging next spring. All of these claims are true, but they are only part of the reason why we rake lawns. Most lawns in the Northern U.S. are made up of one or more cool-season grasses. "Cool-season" lawn grasses are so called because they are most active during those periods of the year when the weather is moderately cool. Fall is one of those times. Blessed with enough sunlight, nutrients, and water, and enjoying temperatures that are neither too cold nor too hot, cool-season grasses such as Kentucky bluegrass revitalize themselves in fall. This is when they must "make hay," strengthening their root systems. But a thick layer of fallen leaves can get in the way of the growth of these grasses. Why? Because, for one thing, the leaves can deprive the grass of one of the key elements just mentioned: sunlight. If not raked up in time, a thick or matted layer of fallen leaves casts too much shade over the grass below. How Fussy Must You Be About Raking Leaves? When the focus is on lawn health, you do not have to rake up every last fallen leaf. The homeowners whom you see hunting down stray leaves as if they were fugitives from justice are motivated by looks: They are striving for the look of a perfectly manicured lawn. If you do not care about that and want to keep your grass healthy, then rest assured that a few leftover leaves can't hurt your lawn. In fact, if you plan on mowing at least one more time that autumn, the mower blade will shred up any remaining leaves. Speaking of mowing, some people address the leaf-removal issue by running a mulching mower over the lawn in fall. The resulting finely-shredded leaves fall harmlessly between the blades of your grass and serve as a fertilizer for your lawn. As an alternative, you could also use a bag attachment on your mower and empty the contents into your compost bin. Note, finally, that not all leaves are created equal in this regard. The leaves that drop from some trees are smaller than those that drop from others. You do not have to worry as much about these smaller leaves, because they are less likely to form a barrier that will harm your grass. By contrast, the leaves from oak trees (Quercus), for example, are quite large. When they fall, they can easily form a barrier harmful to your lawn. Two examples of trees with smaller leaves are maidenhair trees (Ginkgo biloba) and Sunburst honey locust trees (Gleditsia triacanthos var. inermis 'Suncole'). Should I Rake or Mulch My Leaves?